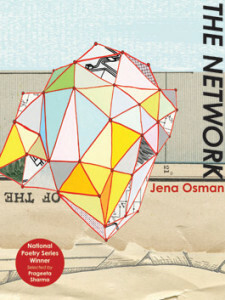 Et sitat fra Cecilia Vicuña tjener som veiviser for de etymologiske oppsporingene i The Network: «To enter words in order to see». I fem seksjoner nøster Jena Osman opprinnelser og sammenhenger, med utgangspunkt i så ulike tema som Sir John Franklins arktiske ekspedisjon i 1845, importrestriksjoner på raffinert, «hvitt» sukker og Financial District på nedre Manhattan. Ordene, og dermed verden, brytes ned i finvevde språklige nettverk som peker på andre, helt konkrete nettverk av talehandlinger og maktutøvelse: amerikansk imperialisme, strukturell rasisme og spekulasjonsøkonomi. Dokumenterende materiale er helt avgjørende for måten The Network framtrer på, uten at boken dermed er en dokumetaristisk diktsamling. Til det er det poetiske nettverket Osman skaper for egenrådig. Snarere handler det, som Vicuna-sitatet antyder, om å bruke poesien som en måte å forstå verden på. 1653: City Tavern on Pearl Street becomes the first City Hall. Stuyvesant orders a protective wall to be built from river to river to keep cattle from wandering off. It then turns into a wall to protect/fortify against the British and Native Americans. But when no enemy appears, the wall falls into disrepair, the wood taken for use as firewood. With word of each new possible enemy, Stuyvesant orders the wall be re-fortified, and this is done with slave labor. Eventually the site of the wall becomes Wall St.
at first the wall was a palisade, a northern limit to keep the cattle from wandering off. Latin literally and figuratively, to squeeze, past participle has root which could well be the Indo-European root, perhaps with metathetic variant. she disguises herself as a simpler person, so as to escape anyone’s notice. follow the small wooden line across the perimeter, from east river to west. compare with Latin (stem, root), a wine-press, and perhaps Russian, Old Slavic to trample, Lithuanian to thrash, flog. she circulates, crosses borders, and hopes she is safe for the night. there were two threats: native americans and new englanders. perhaps also Sanskrit, he knocks with the foot. In the U.S., the example given of the liar’s paradox is “I always lie.” It’s funny how the example changes in your language. [“All Cretans are liars, said the Cretan Epimenides.» – The Epimenides Paradox (ed.)] I’m not sure whether such a difference counts as a ‘mistake,’ but I’m interested in these misalignments, these almost-equivalencies. The ‘law’ can’t stabilize in the face of such differences. Rather, those differences, those slips revealed by language, reveal where there’s work to be done, investigations to be conducted. Jena Osman er poet og redaktør, bosatt i USA. Hun debuterte med Twelve Parts of Her i 1989, og har siden gitt ut en rekke diktsamlinger, blant andre The Character (1998), The Network (2010) og Public Figures (2012). Sammen med Juliana Spahr startet Osman i 1994 tidsskriftet Chain, hvor de begge fungerte som redaktører fram til 2005. Nå utgir de bokserien ChainLinks Books. Osman deltok på Bergen poesifest i 2002, og er oversatt til norsk i antologien Den engelske kanal 2014.